Can Danny and his father outsmart the villainous Mr. Hazell? Danny has a life any boy would love his home is a gypsy caravan, he's the youngest master car mechanic around, and his best friend is his dad, who never runs out of wonderful stories to tell. But one night Danny discovers a shocking secret that his father has kept hidden for years. Soon Danny finds himself the mastermind behind the most incredible plot ever attempted against nasty Victor Hazell, a wealthy landowner with a bad attitude. Can they pull it off? If so, Danny will truly be the champion of the world." Did you know that Roald Dahl loved chocolate, but never ate spaghetti? Or that he was a terrible speller? Or that he had four sisters? 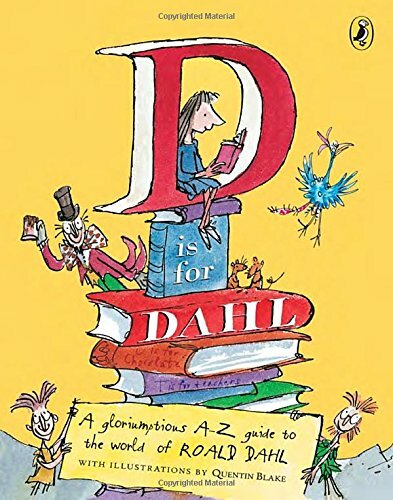 D Is for Dahl is an A to Z collection of facts, trivia, and zany details that bring Roald Dahl and his memorable characters to life. Filled with Quentin Blake's illustrations plus black-and-white photos, each spread is exploding with information about the creator of Willy Wonka, James, and Matilda--from his family tree to the exact type of pencil he used to write his stories. Perfect for devoted fans and Dahl newcomers alike, this is a gloriumptious guide to the world of Roald Dahl.